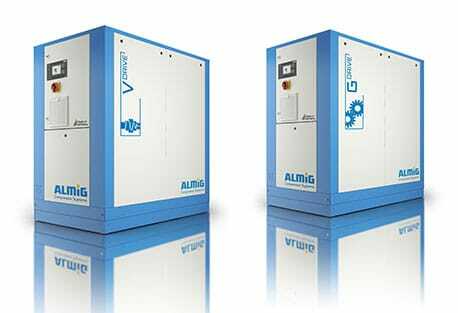 The AlMiG Combi, fast becoming the market leading full feature Air Station. 5.5 kw – 22 kw, there is a Combi available for most small to medium sized industrial operations. With variable speed options available at 11 & 22 kw sizes. Minimal Installation costs combined with maximum efficiency. The perfect compressor for continuous load around the clock. Low-maintenance V-belt drive, good long-term performance. 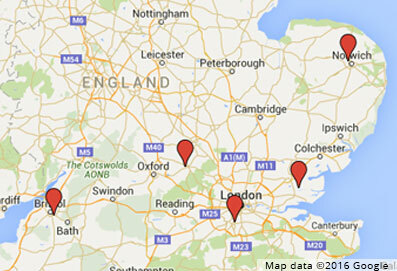 Extremely cost-effective and reliable with low maintenance costs. The BELT;- Series ensures your company benefits from a high compressor output and reliability around the clock. The tenacious compressors are fitted with a low-maintenance V-belt drive, which transfers the 4 – 200 kW of power with virtually no losses. This means that the compressor makes full use of the motor’s output. Variable Speed compressors for maximum cost-effectiveness. Intelligent SCD technology. Speed control. Direct drive. Steeples mains pressure of 5-13 bar. The speed-controlled VARIABLE series has been developed with the latest knowledge drawn from international research. Market analysis shows that on average compressors only have a utilisation rate of around 50–70 %. Maximum delivery volume is only needed during peak times. 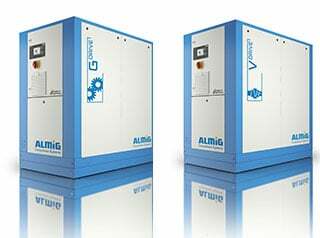 So we developed ALMiG SCD technology, to enhance partial load applications, and reduce energy consumption. 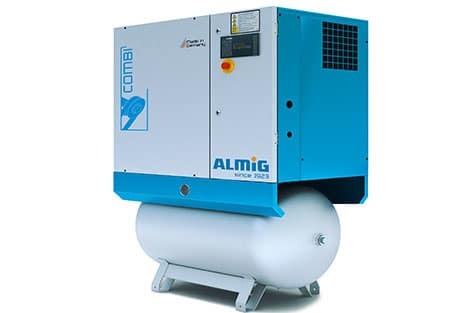 Tough compressors for applications requiring a large amount of compressed air. High delivery volume (up to 71.15 m³/min). Robust drive motor. The “Gear” is easy to maintain and service, with highly efficient air/oil separation. 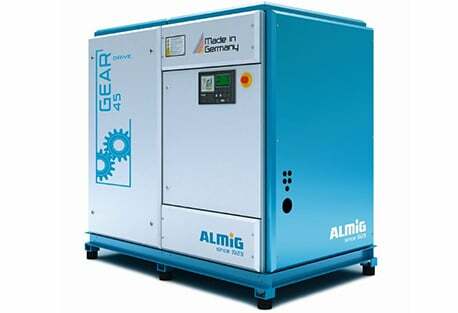 The GEAR series of screw compressors designed for very high compressed air requirements. The product range includes delivery volumes of 3.58 – 71.15 m³/min at max. Operating pressures of 8, 10 and 13 bar. The maintenance and service-friendly drive concept of the GEAR compressors includes a robust drive motor, and delivers minimum slip, high reliability, virtually free of losses. 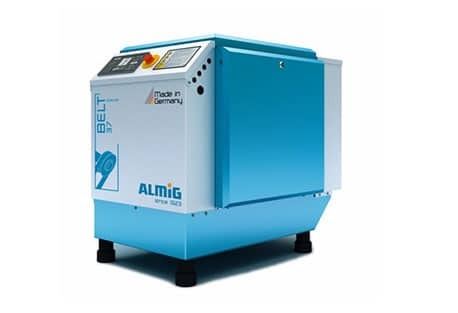 The speed-controlled, directly driven compressors of the FLEX series are based on cutting edge research and technology and are used wherever compressed air is to be generated by a small, compact and extremely quiet system. 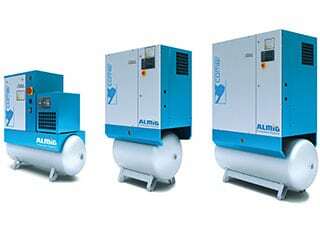 Because of the integrated single-shaft solution, the sound level of these small screw compressors is around 60 dB(A). Whatever you require Activ-Air in association with its Market Leading suppliers can provide the solution. 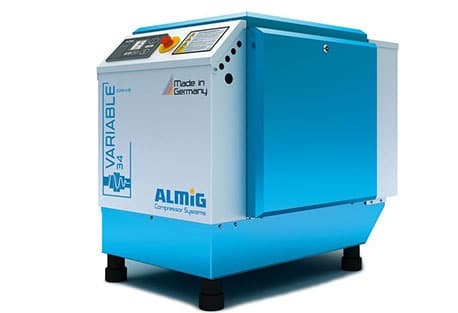 ALMiG have introduced to the UK the V Drive & G Drive range 30 & 37 Kw compressors.